OAU students staged a protest in Osogbo on Thursday. 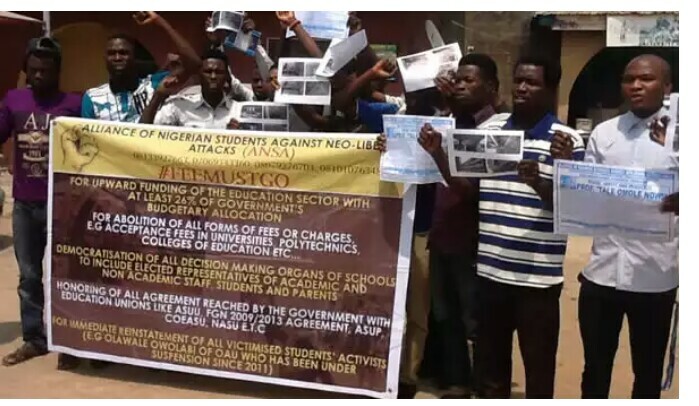 Students at Obafemi Awolowo University, under the auspices of Alliance of Nigerian Students Against Neo-Liberal Attacks (ANSA) staged a peaceful protest in Osogbo, the Osun State Capital. They called on the Economic and Financial Crimes Commission (EFCC) to launch a probe into the Vice Chancellor, Prof. Bamitale Omole, for alleged misappropriation of university resources. In January the students alerted the Nigerian Government through the Minister of Information and Culture, Mr. Lai Mohammed, regarding their concerns about Omole during a visit to the OAU campus. The protesting students said that they have written petitions against Omole, stating they have enough evidence to back their allegations against him. Meanwhile, despite all petitions and allegation, the Vice Chancellor has yet to debunk or accept the allegation. Previously the coordinator of the ANSA, Wole Olubanji, led students to stage a protest demanding OAU reinstate the students union leaders suspended for seeking better welfare for the students.